David is a life-long technologist, problem-solver, and activist. David loves to solve thorny problems in novel domains, expose hidden connections and leverage a little to achieve a lot. David joined Fíonta from a career in the nonprofit sector, having worked for over a decade in the LGBTQ-equality movement in operations roles ranging from the IT helpdesk to the boardroom. Some of his proudest moments at Fíonta included his work with the National Alliance on Mental Illness and Earthworks. David lives in Pasadena, California with his partner and three cats. 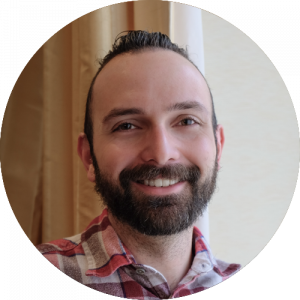 When he’s not writing code, you will frequently find David riding a bicycle up the Santa Monica Mountains, listening to economics, technology or political podcasts, making vegan-middle-eastern-food cooking videos with his partner or working on a home automation project. David also loves to ride in long-distance, cause-related bike rides, including riding 545 miles in AIDS/LifeCycle (for the third time) in 2018.